After covering The United Nations, The Universal Declaration of Human Rights (UDHR), and The Convention of the Rights Of The Child in our social studies classes this term, I successfully used Voki’s with my students to demonstrate their knowledge. You can either record your own voice or use the text to speech box. Use a Google Document spreadsheet to facilitate a collaborative class assignment. Students are now able to access, create, and edit the document. Your students are able to access and interact with the document at one time making it a truly collaborative effort. Sit back and watch the document create itself. Once the document is complete it can be used as a revision tool or may be used again in another subject such as math when covering data analysis and graphing. 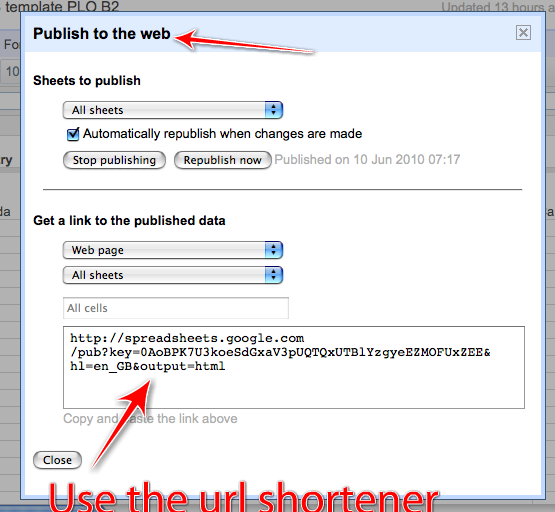 Copy and paste the link Google gives, to publish the website, into the Bit.ly website. Click shorten. Bit.ly will return a short, and more manageable, URL such as http://bit.ly/9pQV. I’m sure you’ll agree that it’s much easier to remember the shortened URL. For those looking for an introductory lesson for the their new class next school year, a great way to get to know your class is to have them fill in this spreadsheet together: Class introduction spreadsheet. There are several ways to turn the process of journal writing or free-writing from an ‘offline’ activity to an ‘online‘ activity, all of which are simple to achieve and easy to manage. Use one of the web2.0 tools below to start a classroom blog. For more advanced users, use the tools below to create independent blogs for each of your students. All blogs need an email address to register, and you’ll be prompted to select a title for your blog. 2. Teacher creates a class blog and then creates individual blogs for each learner in his/her class. This technique is regarded as blogging in its pure form. Learners generate their own content for their blog. 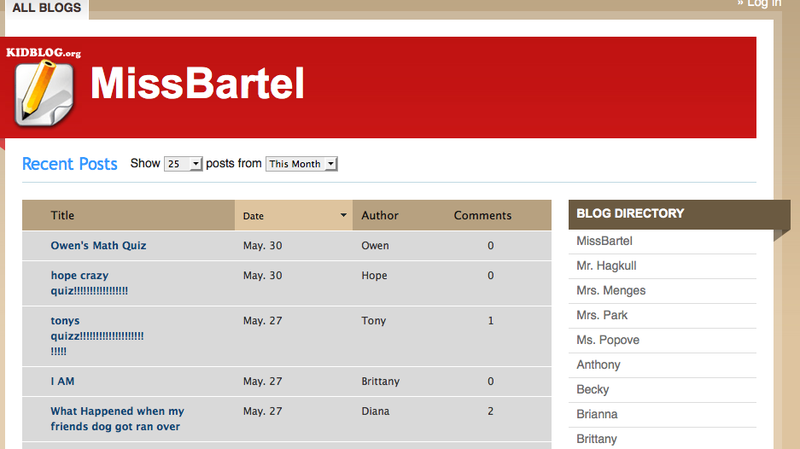 I realize it’s super important to monitor the content that is posted on a class blog or an individual’s blog. All of the above blogging tools offer a variety of security options to make sure inappropriate content never makes it to the live blog. I prefer to select the option which enables all comments go through the teacher to be approved before they are posted to the blog. This ensure the blog represents the school and all its students in the best possible way. 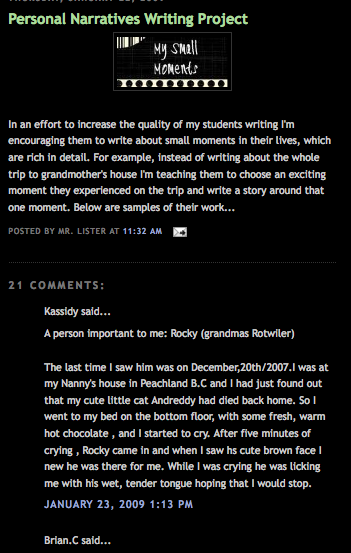 Use the blog as a math journal for personal reflections and word problem examples. Create a Personal Learning Network (PLN) and use technology as a method of communicating, collaborating and sharing ideas. Your PLN may be local: educators in your school, nearby schools, or district wide. Alternatively, you may also decide to develop a virtual or global PLN using social networks such as Twitter , Educator’s PLN, Classroom 2.0, or for Canadian content CEET. Take advantage of social bookmarking. Social bookmarking tools such as Diigo and Delicious allow users to store their bookmarks on the web, which makes them accessible from any computer with an Internet connection. Additionally, these tools allow users to share bookmarks with others. In other words, if you find a great resource site and you’d like to share with your PLN you can do so with one click of the mouse. A very powerful tool in the PLN arsenal. Participate in Virtual Professional Development (VPD). Sometimes as educators we need to take control of our own learning because our Districts are unable to provide differentiated professional development for all teachers. With this in mind, I’ve found workshops, webinar’s, and webcast’s covering a wide range of technology related topics everyday of the week. Here is a link to view upcoming events. Join and participate in technology Ning’s, Wiki’s, and blogs. These spaces are kept current by educators who believe technology integration should be the norm and not an add on. Here are links to my technology Ning’s, Wiki’s, and some excellent technology blogs. Take some time to share your ideas with other teachers in your school. Soon you’ll be learning from them. Sharing and learning with and from others educators makes it easier to keep current with technology and technology integration in the classroom.